The Mark Sandbo era started off in style at Salina Stadium, as Salina Central thumped Goddard-Eisenhower 44-7 in front of a packed house. 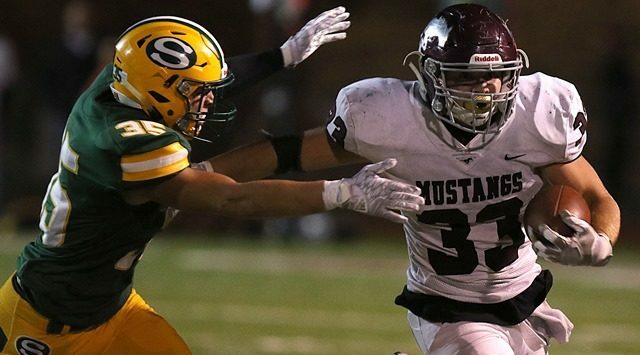 The Mustangs showed minimal signs of being a team with an 18-game losing streak. The win was Central’s largest since a 51-13 thrashing of Haysville-Campus on October 2, 2015. Salina Central gave Goddard-Eisenhower a short field on their opening possession. Eisenhower ate up over five minutes of clock en route to a 34 yard drive that resulted in a 1-yard quarterback sneak by Collin Mackey. Eisenhower led 7-0 with 6:10 in the first quarter. However, that would be the end of the scoring for the Tigers, as Salina Central shut out their nemesis the rest of the way. After a fumble recovery, Mustangs quarterback Jackson Kavanagh hit Quinton Stewart for a 32 yard touchdown strike with 2:49 to go in the first quarter. A missed PAT made the score 7-6 Eisenhower. Kavangh and Stewart hooked up on several big plays throughout the night. Kavanagh displayed shades of his Dad’s playing days at K-State, with several “pop passes” to Stewart that ripped off huge chunks of yardage. Stewart finished with 3 catches, for 147 yards. Central took their first lead on a game-changing 45 yard punt return touchdown by Ben Driver. Driver missed all of last season with a broken jaw, and made his presence felt early and often in tonight’s contest. His special teams score gave the Mustangs a 12-7 advantage with 0:47 left in the first quarter. Kavanagh fired a missle to Logan Hiegle for a 21 yard touchdown with 8:43 remaining in the second quarter. Salina Central led 20-7 at the break. The route was on in the second half. Taylon Peters kicked a 33 yard field goal with 8:20 remaining in the third quarter to push Central’s lead to 23-7. Peters began gashing the Tiger defense, and scored three touchdowns in the final 18 minutes of game time. His first touchdown was a 19 yard cut-back run with 5:35 to go in the third, making it 30-7 Salina Central. He then capped off a lengthy drive with a 1 yard plunge to make it 37-7 Central with 7:27 left in the fourth. Peters final touchdown came with 3:37 remaining in the contest, and was a 6-yard scamper. Peters finished with 154 yards rushing on 22 attempts. Meanwhile, Kavanagh went 10-19 passing with 206 yards, 2 touchdowns, and one interception. Salina Central travels to Derby next Friday. Pregame coverage begins at 6:45pm on 1150 KSAL.